Last week, I wrote a piece looking at minor league players who saw stark decreases in the number of pitches they saw inside the strike zone. My analysis was inspired by recent research by Rob Arthur that suggested drops in Zone% can be early predictors of a breakout. Essentially, Arthur found that hitters who saw fewer pitches down the heart of the plate late in the year often outperformed their projections the following season. By his theory, a pitcher knows a good hitter when he sees one, and chooses to approach him with caution. So when pitchers change their approach, it’s often because the hitter’s gotten more talented. One of the hitters who jumped to the top of my list was Richard Shaffer, a third baseman in the Tampa Bay Rays organization. 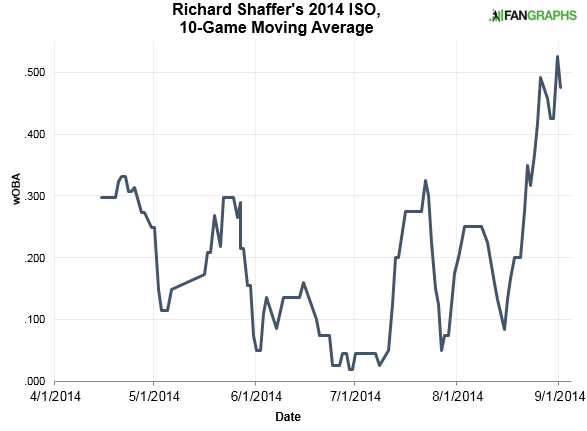 Shaffer spent the entire 2014 season in Double-A Montgomery, where he hit an uninspiring .222/.318/.440. Although he hit for a good amount of power last year, the rest of his game left a lot to be desires. KATOH wasn’t thrilled with this lack-luster season — especially his elevated strikeout rate– and gave him just a 50% chance of even reaching the major leagues. Here’s a look at my system’s full break-down of Shaffer’s odds. Shaffer’s Zone% dropped more any player considered in my study, and dropped significantly more than other hitter in the Southern League. From April through July, pitchers threw Shaffer a strike 62% of the time, and never fewer than 57% of the time in any single month. But from August 1st on, just 53% of the pitches thrown to Shaffer were within the strike zone. A plummeting Zone% certainly can be a sign of fear from the opposing pitcher, but that’s certainly not always the case. There are certain scenarios where seeing more pitches out of the zone might actually be a bad sign. Maybe word gets around the league that a guy can’t lay off curveballs in the dirt, and pitchers respond by bouncing every other pitch. In that case, more pitches out of the zone might indicate a collapse instead of a breakout. But Shaffer’s drop in Zone% appears to be of the good variety. It wasn’t the only sign that something changed with the 24-year-old, as it corresponded with a huge spike in his overall offensive production. While Shaffer’s overall numbers were pretty unremarkable, he hit .357/.486/.768 with six homers over his final 17 games. After four months of mediocrity, Shaffer ended the year hitting like a star. It goes without saying that small sample size caveats apply here. We all know that three weeks of games aren’t nearly enough to make any definitive conclusions about a player’s talent level. 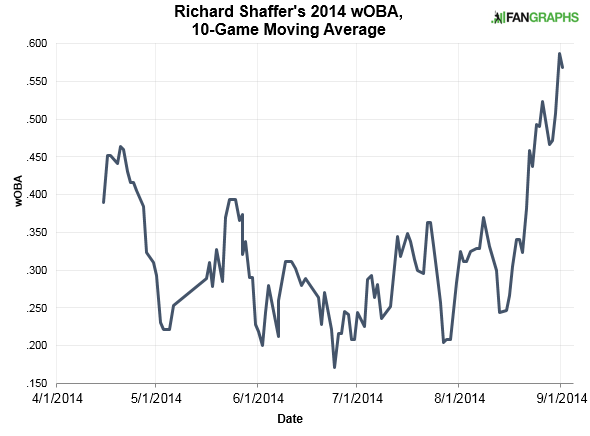 However, unlike many eye-popping, small-sample performances, Shaffer’s wasn’t the result of a fluky BABIP. Over those aforementioned 17 games, his BABIP was .333. That was higher than the Southern League average of .301, but wasn’t enough to explain Shaffer’s performance spike. Instead, Shaffer got it done by improving his strikeout, walk and power numbers — metrics that become reliable more quickly. In an interview conducted by our very own David Laurila in spring training, Shaffer chalked up these improvements to a change in approach for his improved hitting. I finished last year really strong … I’ve made adjustments and am more direct to the ball with my hands, and more under control with my lower half. I’m mechanically sound and more physical this year. 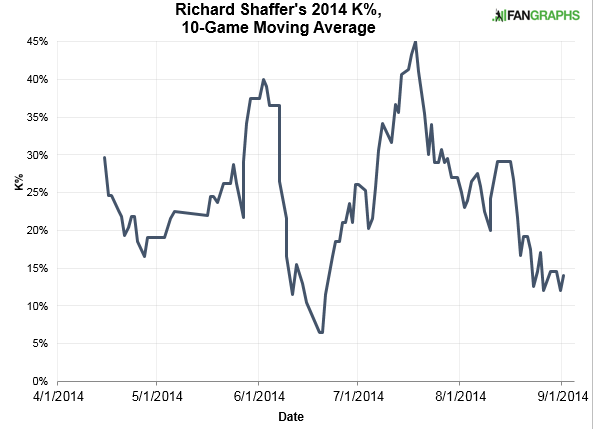 Despite his late-season surge, Shaffer got very little love from prospect evaluators last winter. MLB.com pegged him as the Rays 22nd best prospect, Baseball America and Keith Law had him at #20 and #17, respectively, and John Sickels merely listed his name in the “others” section. Baseball Prospectus didn’t even mention him. Here at FanGraphs, Kiley McDaniel nearly excluded Shaffer from his Rays list, which went over 50 deep. However, he changed his mind after talking with people within the Rays organization, who praised the adjustments he’s made in recent months. [Shaffer is] another stalled former 1st rounder with plus bat speed and raw power has been so bad I wasn’t going to mention him at all until Rays personnel raved about his offensive adjustments in instructs; I’ll give him one more season. Shaffer may not be much of a prospect these days, but it wasn’t always that way. In fact, he was a first round draft pick less than three years ago. After a stand-out junior season at Clemson, the Rays took him with the 25th overall pick in 2012 — ahead of Joey Gallo, Jose Berrios and Jesse Winker. He closed out his draft year by hitting .308/.406/.487 in the New York-Penn League. Heading into 2013, our own Marc Hulet ranked him the 7th best prospect in the Rays organization. 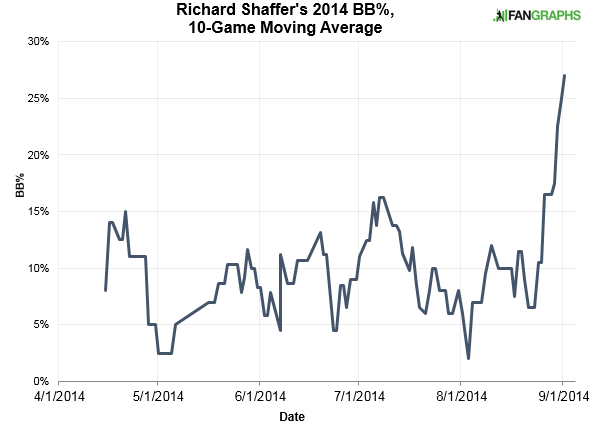 However, as so many highly-regarded prospects do, Shaffer stopped hitting once he got to full-season ball. In 2013, he hit a disappointing .254/.308/.399 as a 22-year-old in High-A, and save for his absurd month of August, did more of the same last year. All told, he hit a disappointing .239/.322/.410 in over 1,100 plate appearances between High-A and Double-A. As a third baseman in the Rays organization, Shaffer’s path to the big leagues isn’t clear. Evan Longoria obviously has the Rays third base job on lock, and given the 8/$117M left on his contract, that’s unlikely to change any time soon. Even so, if Shaffer hits well enough in the minors this year to merit a late-season call up, the Rays would surely find a spot for him. Shaffer’s dabbled at first base in the past, and the Rays first base and DH options aren’t exactly world-beaters. Plus, three three of them — James Loney, John Jaso and David DeJesus — struggle against lefties, which could open up some at-bats for a right-handed hitter like Shaffer. Not all high draft picks hit well right out of the gate. In fact, many don’t. Often times, players in this category never make it out of the minor leagues, but sometimes, these hitters figure things out. Neil Walker, Denard Span, Drew Stubbs and Trevor Plouffe — all first round picks — had middling minor league numbers, but wound up becoming some of the league’s better hitters. Shaffer’s late-season surge very well might be just a flash in the pan. Most small sample performances are, but it’s easy to talk yourself into thinking something has clicked for the erstwhile first-rounder. Shaffer thinks he’s made the right adjustments. People in the Rays organization think he’s made the right adjustments. And based on the number of strikes Shaffer saw last year, opposing pitchers seem to think so too. Soon enough, we’ll find out if they’re right. We hoped you liked reading Richard Shaffer and Detecting Improvement by Chris Mitchell! Thanks, really enjoyed this. Keep up the good work!